It was time for the semi-final of the Euro U21, and the derby of Scandinavia. There was much talk (as Guidetti said after the game) about how the Danes were going to be the better team with the amazing Hjöbjerg in charge of this Danish side, and how this would be an easy win for Denmark. 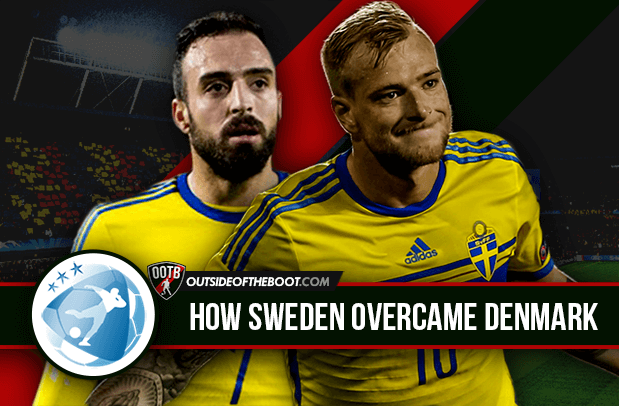 But we all know that Sweden are the come-back kings of teams and have made the ‘’impossible’’ possible before. The game started of exactly the way Håkan Ericsson predicted as he said after the game that he was aware of the fact that Denmark were going to play possession based football and that Sweden (we) should focus on exploiting and threatening through the counter-attacks. Sweden opened up the game with, at first, a penalty goal from Guidetti and 5 minutes later, an assist from the same player for the 2nd goal to Tibbling. The 2nd half started off better for Denmark, who also found the net to make it 2-1, but that was not enough despite the effort made to get back in the game from the Danes. Sweden found the net 2 times again in the 2nd half to end the game with a 1-4 victory, giving Sweden a ticket to the final vs Portugal. 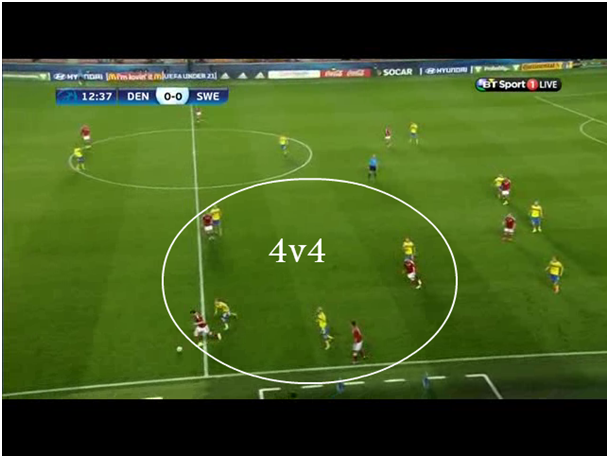 What makes this Sweden team so special is how well they execute the special and well-known 4-4-2. The 4-4-2 has a long tradition and is the most known and used formation in Sweden, due to the influence of England. Håkan Ericsson, the Swedish manager has really found a great, hardworking team, a team that can at times remind you of the fantastic Atletico Madrid in the 2013/2014 campaign in which they won the La-Liga, with a compact, defensive 4-4-2, trying to close every inch of space that the opposition might attack through. What Håkan has implemented in this great U-21 team of Sweden, is the hard work that the players put in, where the wingers provide lots of effort running upside-down, as Khalili ( Left-Midfielder of the 4-4-2 ) is often seen as an extra full-back or even at sometimes covering up for Augustinsson (left-back of Sweden). Denmark is a team that tries to play possession based football, where we often see the 2 center backs splitting to provide space for a midfielder to drop deep as the full-backs penetrate higher up the flanks. The game against Serbia also showed how they could easily switch between the positions with Höjbjerg often seen in a free-role penetrating as a second-striker. 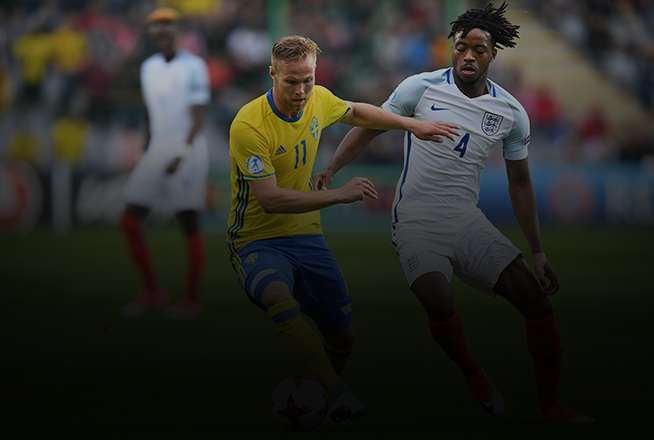 This was all taken into consideration by Håkan Ericsson as Sweden played very deep and waited for mistakes. To understand the team-work of Sweden and how they play their defence, let’s split it up into different parts starting with the 1st line of defenc: Strikers. Guidetti and Thelin were always seen working and running hard to help and provide the extra help in defence (depending on the situation) by creating overloads, especially on the flanks. As Sweden let the Danes keep the possession of the ball, Guidetti and Thelin dropped deep and tried to close the centre-channel to basically force Denmark to play it wide. 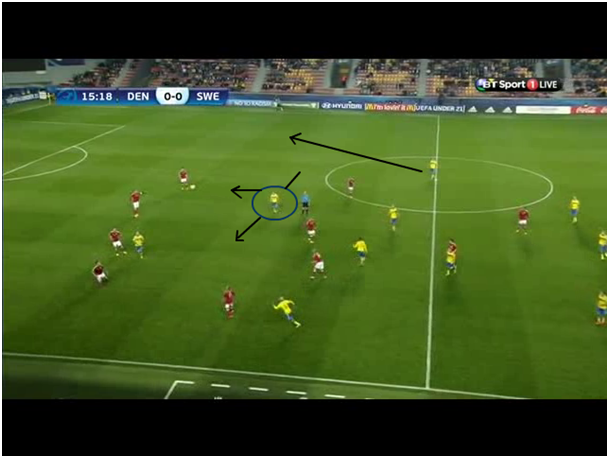 We could often see Vestegaard (Danish CB) starting attacks for Denmark as Sweden tried to occupy the important players during the build-ups. Now as Guidetti and Thelin focused on closing / covering the central-channel, Denmark fell into the trap and tried to play through the flanks. Here Sweden was seen winning the ball back from Denmark with great ease. Here we can see how Khalili (LM) and Lewicki (CM) directly approach the Danes with an aggressive press, both close to not let the Danes play through the midfield line. Notice also how Hiljemark (CM) and Augustinsson (LB) are close to the area to cover up for any player trying to penetrate this zone/flank. Just seconds after Lewicki has continued the pressing on the ball-holder, Khalili, Hiljemark and now even Guidetti have occupied/marked one player each in this zone/flank, to cover up for Lewicki but also to close down space for Denmark, who were eventually forced away from the situation, to start the build-up all over again. Here is a situation where Sweden is creating overload/outnumbering Denmark on the flank. It has been mentioned that the strikers worked hard and put in a lot of effort for the team. Notice how Sweden uses their strikers to help whenever the help is needed. 1) A very compact team with many players behind the ball. 2) Denmark were once again trying to play through the flanks as Sweden were mainly focused on closing down the central areas of the pitch/ half-spaces, which led to Denmark trying to find a way through in the flanks, but Sweden were defending these areas well too. 3) Notice the black-marked player Guidetti, and how he has dropped deep to provide extra help as he was trying to help Sweden to outnumber Denmark. His effort has created a 6v5 situation. Two very important figures of this Swedish U-21 team are the 2 Centre-Midfielders. 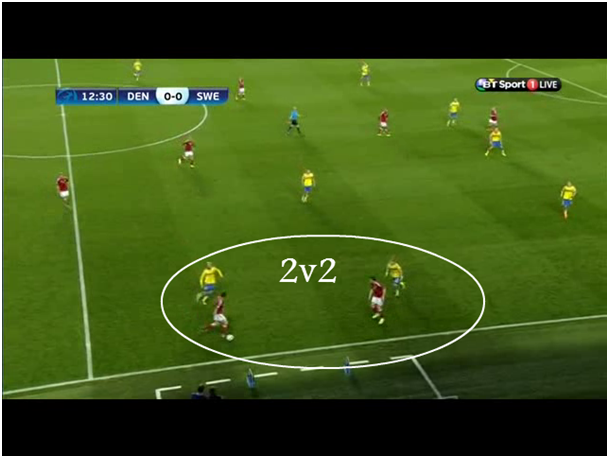 They both work in the same manner but Lewicki focuses more on the left-side/zone of the pitch and Hiljemark the right. Lewicki and Hiljemark show great team-work and coordination with the defence and midfield, and they are often seen pressing, covering, and defending in different ways, positions, and zones of the pitch. 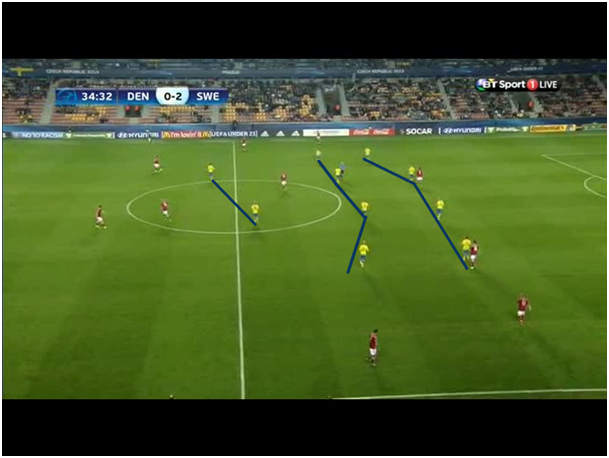 Here we have the left-side of Sweden (right-side for Denmark)where we see Khalili putting pressure on the player in his Zone (Zonal-Defending). Notice how Lewicki (CM) is following the player behind Khalili to cover up for him to not let the half-space of Sweden’s defence be exploited. Now Lewicki has continued his marking, which has dragged him away from the CM position to the flank, but as he has done this, Khalili has positioned himself a bit more centrally to cover up the centre/half-space and create a 4-man line together with the other midfielders, still keeping a 4-man midfield line. Now Khalili and Lewicki have switched positions. Once again the Danes are shown here trying to create something from the wide-areas, and here Augustinsson (LB) has put immediate pressure on the opposition player, which basically leaves a gap behind him and forces Helander (CB) to leave his position. Now Khalili (LM) recovers for Augustinsson to help him create a 2v2 on the flank. Notice the position of Lewicki, who is covering for Helander (CB) as he has left a great gap between himself and Milosevic (CB). Now Agustinsson (LB) is positioned as a wide midfielder, while Khalili has dropped deep to provide help for Augustinsson on the flank, acting as a left back while Helander and Lewicki switch positions again, as Helander positions himself as the CB again and Lewicki back to the middle of midfield. This is a perfect example of how well organized this Swedish team/defence is. 1st of all, Kiesse-Thelin is a very strong attacker, with great balance and 1st touch. 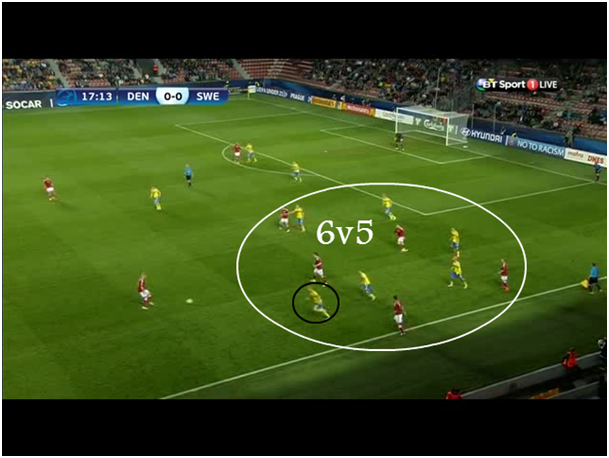 To take maximum advantage of his physical abilities/advantages, Sweden played many direct-long balls towards Kiesse-Thelin, who was supposed to either keep the ball in possession or by head it through to Guidetti who made the deep-runs behind the high defensive-line. An example of Thelin keeping possession of the ball after a throw in, due to his strong ability to hold up the ball with his back towards goal. This is just a small example of how Sweden uses Thelin. Here is a direct ball from defence (Sweden were not interested in playing possession based football) towards the attackers. Now they did this for a reason. 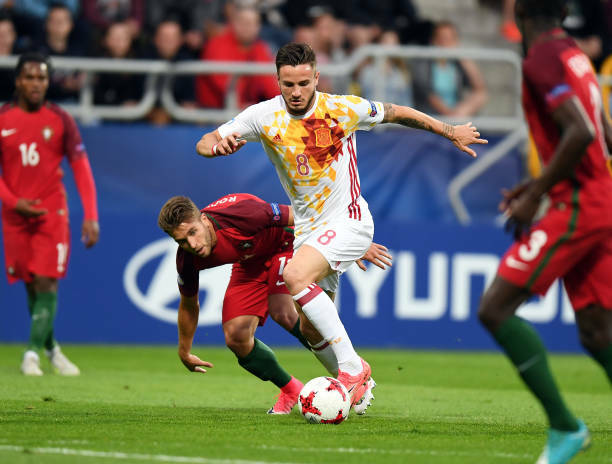 The idea was to let Thelin once again be the one to take on the heading-duel, and to eventually head it towards Guidetti, who was running behind the Denmark defence, or to at least keep it in possession and play it back to a midfielder. 1) Something that looks like an impossible ball, because of how Thelin is isolated against 3 defenders is a move that is well executed by the Swedes as you can see how Tibbling (RM) is starting to position himself near Thelin, for an eventual header-pass in front of the defenders which Tibbling will be able to snap-up. These long-balls were often played to Thelin, and due to his strong physical abilities, to win headers and occupy for-example 2 defenders at the same time, he was the one to win the penalty for Sweden, after a long-ball being played towards him. 2) Notice how Augustinsson is positioned very high and wide. This is to let Khalili penetrate more centrally (as an inverted-winger). 3) I’ve talked about the defence, but notice here how Lewicki is the one to provide the balance and prevent an eventual counter-attack from Denmark, basically covering up for Augustinsson (who has joined the attack). Lewicki has also often served as the link-player while in the build-up process, which gave Hiljemark more freedom to penetrate and attack in transitions (and this was exactly how Sweden scored the final goal of the game). Thelin has dropped deep to head the ball towards Guidetti. Notice how the blue-marked player Tibbling (RM) has positioned himself much more centrally to help the team with the recovery of 2nd balls. It also allowed them to make use of Tibbling’s abilities, and great close-control dribbling. Because of his lack of speed he drifted into the middle, and opened up the space on the flanks for Lindelöf (RB) to penetrate. Again, notice how Tibbling has positioned himself more centrally to open up the flank for Lindelöf (RB) to penetrate in, and also to provide help to counter-attack through the central-area and then be the one to play it wide, forcing Denmark to switch sides while in a defensive-transition, which will create problems for the defence of Denmark. Denmark were the better side during 20 mintues of the 2nd half, but Sweden continued with their great organized defence and quick counter-attacks, thanks to the very high Danish defensive line who were desperately trying to help their team find a way back into the game. Håkan Ericsson said after the game that he was a bit disappointed with the build-up attempts of Sweden as he believes that these kind of games, will not occur again and that Sweden needs to develop this aspect of their play to be able to play through teams in different ways. Sweden are now in the final of this tournament for the 1st time ever, and the team has already secured a spot Olympics (football) and will now play against the very terrific attack of Portugal, with the main-star of the tournament Bernando Silva in charge. Denmark was, as against Germany, trying to play possession football, but were too naïve as Sweden could easily counter-attack and exploit the high positioned defence of Denmark. Defence vs Attack – who will win ?